I just love pretty little things with extra special details. After all it’s the small stuff in life. 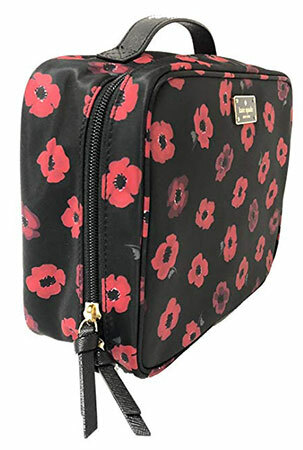 This nylon cosmetics case from Kate Spade it big on style but small enough to toss in your handbag or stow in your luggage. Find out why this pretty little Kate Spade New York Travel Cosmetic Case is so beloved and highly rated. This lovely Kate Spade Travel Cosmetic Case is beautiful, and practical for the modern lady on the go. The feminine sleek design is minimalist and attractive. made from a high quality nylon material, it’s easy to wipe down and keep looking fresh. After all a foundation spill, lip gloss leak or, life happens now and again. It’s just the right size to store in a tote for the day or in your luggage for a trip or getaway. The dimensions are 7″h x 9″w x 2″d which is large enough for all of the essentials plus some. A zipper book style is provided for partial or full opening. A special detail is the 14 karat gold plated hardware Kate Spade logo on the front of the case. The Kate Spade cosmetic case is trifold. 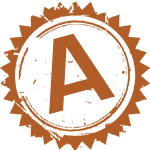 –Three interior zip pockets are provided including one with a with snap pocket. Additionally there are three interior slide pockets. That leaves plenty of space not only for cosmetics but face wash, brushes and even some cotton swaps and make up remover. I’d use it also to store a travel size contact solution and an extra set of contact lenses. The interior is also easy to clean, which is a necessity for a cosmetic case. As with all Kate Spade designs this nylon bag is high quality and durable. It’s well-crafted from a sturdy yet some material that is resistant to stains and scratches. Cleaning it is a breeze. It’s likely to endure daily use for years to come. Well the bag news is, this bad is pricey. You’re looking at around $100 bucks or so, depending on the sale. Something tells me though, it’s you’re reading this article, you’re willing to dish out the dough for what you know to be a quality product. If you’re looking for a higher end, name brand cosmetic bag, this is worth the extra cash. 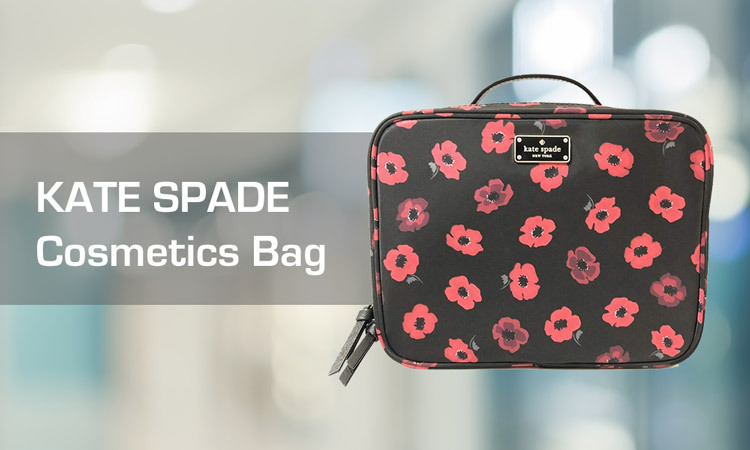 All and all this Kate Spade Cosmetic bag is beautiful, sleek and perfect for the modern fashionista on the go. The size is just right for travel, offering plenty of space for the essentials. Even though it’s a bit pricey, you get what you pay for in quality and design. It’s durable material is easy to clean and maintain making it a cosmetic bag that will likely last for years. 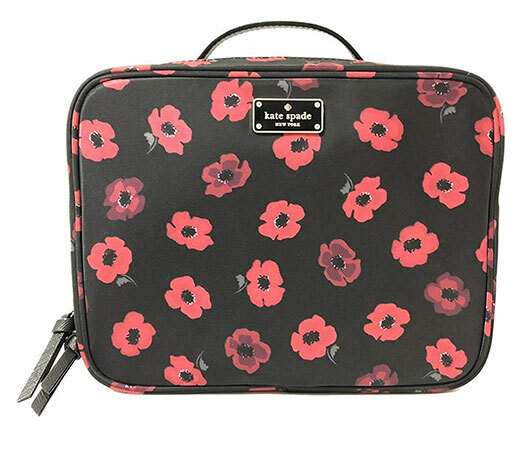 Just a click away, this Kate Spade Travel Cosmetic Case is available on Amazon.